The Other Steve Jackson’s Sorcery! | SPACE-BIFF! ← Blood Dragon! The Eighties! High Five! Steve Jackson and Steve Jackson. Most everybody knows there are two Steve Jacksons — rumors have circulated for years that there are others, but really there are only two, and it’s even possible that they’re actually the same person running the most confusing long con of all time. This everyone knows; but what very few people know is how to tell them apart. It’s probably a safe bet to say that they’re both well accustomed to people confusing them for the other Steve Jackson. It doesn’t help that they totally look like the same dude trying to disguise himself with hair dye, a glued-on mustache, and a pair of glasses. What’s your angle, Mr. Jackson — or should I say… Mr. Jackson? Anyway, here’s why I’m telling you this. Back in the ’80s and ’90s, when the Choose Your Own Adventure children’s gamebook series from Bantam Books was lucrative beyond belief, with over 250 million copies sold in under 20 years under that brand alone, and everybody from R.L. Stine to the intellectual properties of Disney, Indiana Jones, and Star Wars were racing to get in on the gold rush, Steve Jackson (the English one) wrote what many enthusiasts consider to be the greatest CYOA title ever. Correct, there are CYOA enthusiasts, and yeah, the four-part Sorcery! is pretty damn good. 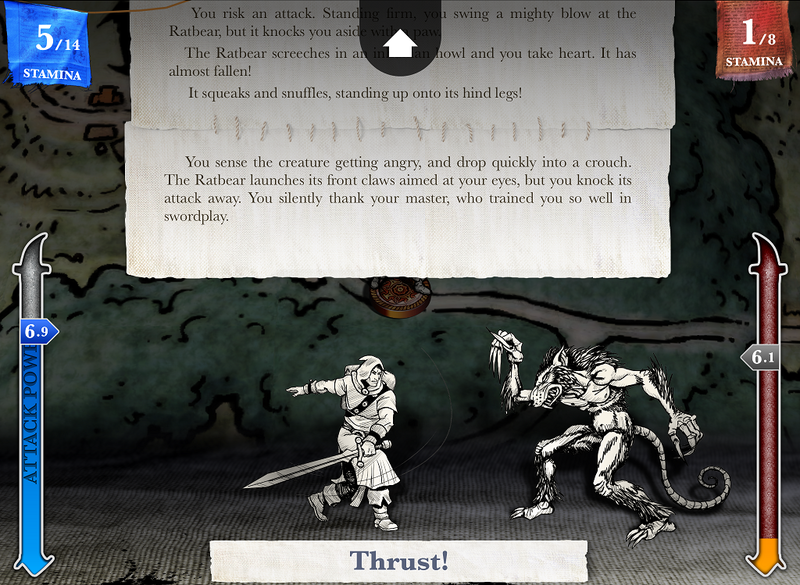 So good, in fact, that Inkle Studios recently ported the whole thing over to iOS so that even boring regular folk who wouldn’t be caught dead reading a CYOA book can enjoy it. Sorcery! takes place in a fantasy world where some evil douche sorcerer has stolen the Crown of Kings, a powerful artifact that bestows magical abilities of leadership to its wearer, and hidden it away in his distant fortress until he’s ready to unite the lawless regions against the unified orderly kingdoms that have historically been able to keep the barbarians at bay. Since your home country of Analand was the one to lose the Crown, it’s your responsibility to seek out the Mampang Fortress and bring it back. The journey is dangerous and long — so long that this game is only the first of four installments, “The Shamutanti Hills,” with the next three episodes coming later as in-app purchases. And even though it might sound a little disappointing that this entire game covers just the first steps of an epic quest, the result is a fantastically deep piece of interactive fiction that never lacks for adventure, exploration, intrigue, and piles of agonizing decisions. 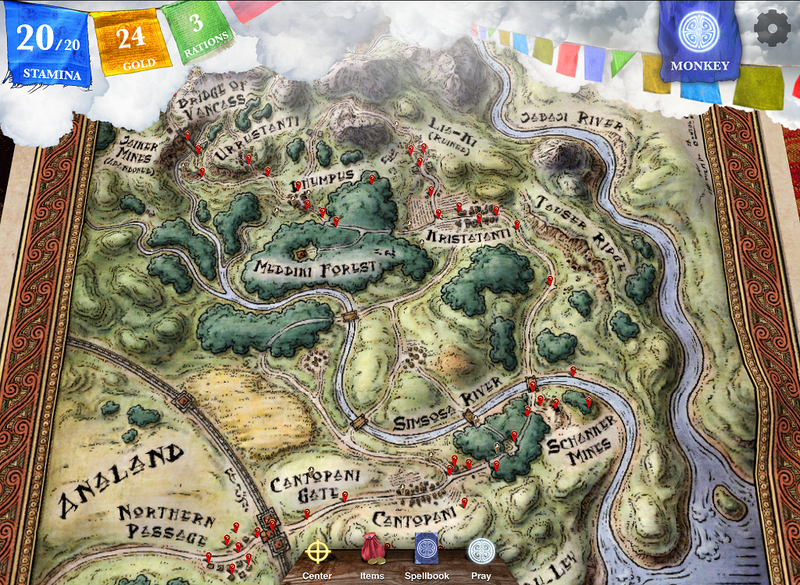 These decisions are at the heart of Sorcery!, as you’re constantly faced with the prospect of multiple routes, though instead of flipping from page to page, you actually get to trace your passage across a beautifully-rendered three-dimensional map of the wild country that sprawls beyond the walls of Analand. Sometimes you can make informed decisions by gauging the logic of the story, assessing your stockpiles of gold or food, or casting magical spells at the expense of your ever-waning stamina; at other times you’ll have to make blind decisions and live with the consequences. Either way, your route will gradually be marked on the map as you hike from the relative safety of a few border towns all the way to the city of Kharé in the distant north, and being able to look back over the record of your passing is wonderful, whether to see when was the last time you dared go into town rather than skirting around the outskirts, or how many times you wasted your precious stamina on side-adventures, or just looking back on the road for the sheer tactile joy of it. I used to read CYOA books with a dozen bookmarks on hand. Between those, half my fingertips, and a few dog-eared pages, I’d work my way to whatever ending the adventure saw fit to provide, and then rewind my progress to take a different path. At times, I’d even make obviously suboptimal story choices just so I could eliminate one branch of the story before I took the one I really wanted to see. Sorcery! lets you do something similar, and it’s a great nod to the way CYOA books let you cheat by flitting between the possibilities as often as you want. Rather than forcing you to start over when you get stuck or killed, you can go back and click on any of the little red flags that indicate the path you took, thus backtracking to previous decisions and letting you get out of any possible dead-ends or shameful deaths you might encounter before the conclusion of the adventure. There isn’t a limit to how far back you can go, either: if you suddenly realize you regret your decision to go into town and thus get roped into a quest to save the village elder’s daughter a half-hour earlier, you can undo it in an instant. The simple combat system is a nice touch. Now, at this point you might be under the impression that Sorcery! is exactly like all those CYOA books in which all you did was read a page and then make a (usually binary) choice that sent you to a different page, and on and on until you reached one of the book’s promised forty endings. See, the Fighting Fantasy books weren’t quite so simplistic. They included actual role-playing, which means Sorcery! has a few other systems chugging under the surface, and they set it apart from many other pieces of interactive fiction out there. For one, it’s got a combat system that ties in with your waning pool of stamina. And since you’re also playing a constant game of cat-and-mouse between your stamina and the frigid blackness of death by fatigue, even losing a few too many points in combat can really hurt you in the long run. In a way, it’s something along the lines of a light survival game, with you constantly juggling your stamina, the gold you need to buy supplies or favors, and the food rations that keep your belly full. Or you could pray to your patron spirit, though as always these are fickle in granting their favor. There’s even a surprisingly deep magic system that works by invoking three-letter combinations, like ZAP to blast an enemy with lightning, WAL to create an invisible barrier that can keep monsters at bay, DOP for opening doors, HOW to find your way when you’re lost and uncertain, and many others. You can even deduce crazier or more powerful spells by finding clues or by puzzling through your spellbook. Between the depth of the game systems, the strength of the story, and the beauty of the presentation, this first installment in the Sorcery! series is easily one of the most compelling examples of interactive fiction or a Choose Your Own Adventure story I’ve ever encountered. It doesn’t take long to get through, maybe two hours, but there are so many possible routes through the story that it’s delirious fun to go through the story again and again, taking different paths each time and observing as the journey bends to your actions. I like. 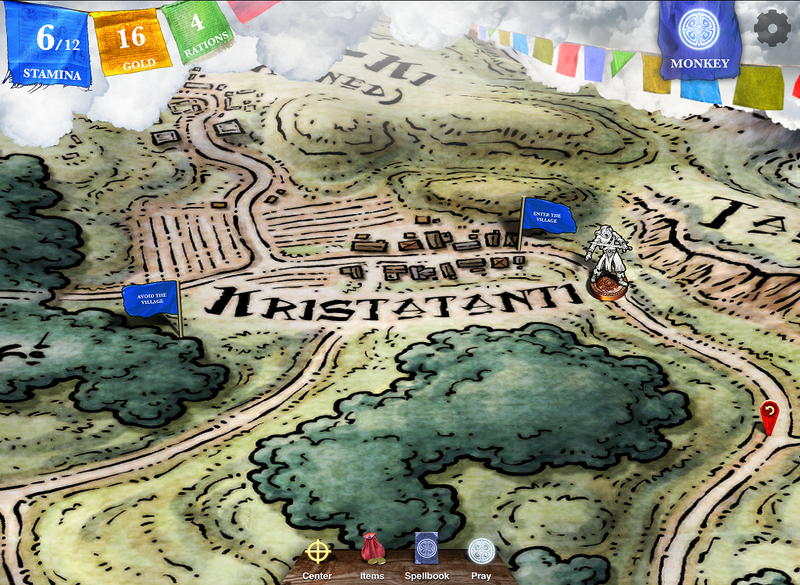 Posted on June 24, 2013, in Reviews and tagged Inkle Studios, iOS, Sorcery!, The Other Steve Jackson. Bookmark the permalink. 5 Comments. Oh thank god. I’ve been missing SB! And I don’t even have an iPhone! Likewise. And likewise. Welcome back, SB! Well, unlike everyone else here apparently, I have an iPad. And this IS a good game.